Refinishing your boat interior the cost effective way. Using furniture grade vinyl we can transform your boat interior to something special. Interior Refinishing taken to the next level with this Sealine S34 Power Switch Panel. Walnut to Carbon look. 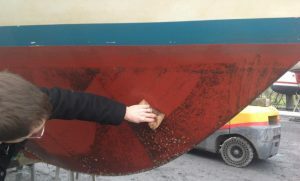 Giant Stride Graphics is pleased to confirm that we can now offer Macglide Anti Fouling Silicone coated vinyl wrap. Restyling the interior of boats the cost effective way. Changing boat colours and look with vinyl wrapping offering different levels of protection. Renewing boat stripes and badges creating new looks and styles. Opening up new levels of boat name design creating stylish new looks. Commercial Boats, Vans, Buildings and Safety we have your business covered. Our growing range of off the shelf products keeps increasing. IMO Photo-luminescent Signs can now be brought easily for your vessel. Our range of products available for online purchase keeps growing here are some of our newest listings. If you scroll to the bottom of the page you can join our mailing list to stay up to date as we develop our online catalog further.